Before you can commence using the umpire allocation functionality there needs to be at least one active club in your database and the umpire database needs to have at least one active member who is a Umpire/Referee/Match Official. Once you have created a club to house your Umpire/Referee/Match Official, the Umpire/Referee/Match Official Allocation system can then be linked to that club (SportsTG will need to switch on the Umpire Allocation functionality for that club). The first step in allocating officials to your matches is to configure the umpire types. Configuring and activating your Umpire Types will need to be done before you can allocate officials to a match. Please note: As the terms Referee and Umpire differ from sport to sport, for this example the term will be Match Official. The screen shots will show the Referee examples. 2. In Umpire Allocations click on the Configuration tab. Select a competition from drop down list and hit Continue. 3. 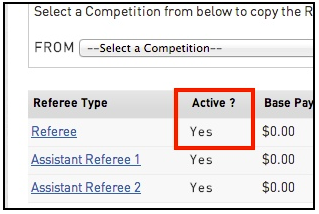 From there you will need to select an Umpire/Referee/Match Official Type that you wish to activate. The Umpire Types are set on a sport by sport basis. 5. Once your Umpire/Referee/Match Official Type has been set as Active, it will display as shown below. 6. Once you have activated the Umpire/Referee/Match Official Type you will then be able to allocated a match official as Umpire/Referee/Match Official #1 for example. If you require additional member types you will need to activate those Umpire/Referee/Match Official Types.